Stepping away from the poetry for a bit and this paperback cover caught my eye. Does anyone out there know this novel? This looks to be an early 1960s paperback and was written by Andre Norton. 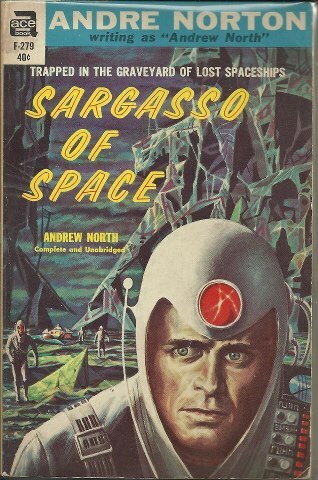 Of course, anything with the word ‘Sargasso’ in it is going to catch my eye but a science fiction novel. And the tagline, “Trapped in the graveyard of lost spaceships”, definitely caught my interest. So does anyone know this novel and, if so, could you say that it is Hodgson inspired? I’d be curious if this is an updating of sorts of WHH’s stories “From the Tideless Sea” into a science fiction setting. The cover artwork is by Ed Emshwiller who, apparently, did quite a number of paperback covers during this period. Any information would be appreciated and, as always, credited here! I remember and had this book in the original Ace Double version that was released under Norton’s pseudonym, Andre North. Ace eventually re-released it under Alice Norton’s ‘real’ pseudonym, Andre Norton. The copy I had was notable for a typo in the title of the original double which announced the book as “The Sagasso of Space.” I think the basic premise of the book owes more to the notion of the earth side sargasso sea than to any of Hodgson’s creeping fungus tales. But who knows. Norton was certainly aware of WHH’s work. I have heard that Norton’s NIGHT OF MASKS is inspired by THE NIGHT LAND, so maybe . . . . . Sorry, no image comes up for that link? Ah, yes. I rather like that one. That is also, btw, the first paperback edition of HoB. Just because it has sargasso and the like doesn’t mean a Hodgson influence. It was a long time before I discovered Hodgson, but knew of the idea of the Sargasso Sea (and the idea of a place that trapped ships and the like) thru other works. Nope, it doesn’t mean Hodgson at all but it was enough to make me wonder as someone who’d never read it before and thought it would make a nice, short post here. But, Hodgson himself thought of the Sargasso as his “private hunting ground” so I am always curious when I see the word.